Very few of us in the extreme sports crew will be blessed not to deal with a back injury at some point, especially the snowboarding crowd. “Hard” data is difficult to come by, but according to some estimates, an average of 2-3 people sustain a winter sport-related injury on any given day. However, most of those injuries are localized to the extremities & the head and neck area. It’s no surprise that it’s your extremities that take on most of the risk, as you chuck them around trying to do 5 flips and inverted rotations. While the most common injuries (like wrists or elbow) are typically not a career-stopper, back and spine are a whole different story. The most frequently traumatized part of our torso is the coccyx (tailbone). Even a sprain of the lower back is tricky to recover from because it’s where every motion of the body starts. So, today, we take a brief look at prevention (brief because most of us are responsible enough to know this stuff) and a closer look at the process of recovery. Let’s start with the obvious – pads and safety gear. Safety gear goes beyond just physically protecting the area by padding it. Good gear will be designed with the physics of motion in mind. In other words, it will lower the forces exerted on your body in a fall. Elbow, knee and wrist guards will do that for your joints, and few snowboarders will be irresponsible enough to step on that board without the pieces. However, a tailbone pad is often overlooked & it should be one of the most important protective pieces. 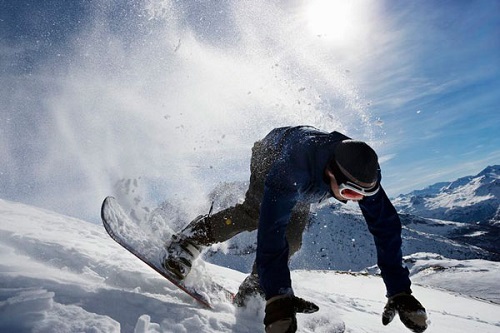 While the above-mentioned guards for your extremities will protect you in the case of a fall, a tailbone pad does more than that because, even if there’s no accident, snowboarders will spend a good chunk of their day on their backside. When it comes to the two most important joints in your extremities (the shoulder and elbow), a smart snowboarder will take the time to learn the physics of joint motion, so even when you do fall, you fall right. Once the deed is done and your spine or the coccyx has suffered some type of trauma, the first thing to understand is that you can’t be too cautious or take it too slow. Just take a moment here to think about the intricacies of the spine – every single muscle in your body is controlled by a nerve that starts its “journey” in your spine. We don’t want to sound too “parenty,” so let’s move on to the specific tips about recovery. There are a few things as frustrating as a back injury, as the pain is there with pretty much every motion. So it’s easy to take a negative attitude within the first few days and maintain it all the way through. Developing this kind of anxiety is not just about your mental well-being, it has a substantial effect on how fast you heal, too. We’re not about to engage in a conversation about positivity and how it affects our bodies, what we’re talking about is that anxiety will make it much more difficult to closely follow the recovery guidelines. It is those first few days after the injury that will define the “tone” of the process, so do your best to develop a positive attitude. We would go as far as to say that making jokes about what happened is not a bad thing. If you follow all the guidelines we are listed here, the first one should come naturally. But proper spine alignment is trickier, to the point where you might need to think about replacing your mattress. If the mattress you have doesn’t offer fitting support, it can become the most important factor in delaying recovery. If the injury is more substantial, every cent invested in a good mattress is more than justified, especially if you have in mind that you’ll be using it long after you’re well again. One type of mattresses that stands out here are the adjustable airbeds. It’s the only type of mattress that will give it the option to choose your firmness and play with it until it feels just right. Adjustable beds are high-end and come with a price tag to match. The last thing you want is investing thousands only to realize that the mattress is not right for you. Before going down that road, get yourself a cheap inflatable bed that also has the firmness adjustability feature. A week of sleeping on an air mattress should give you an idea of whether investing in an adjustable bed is worth it – you can see some of the better air beds here. Our bodies are fascinating mechanisms and you can be sure that yours will do its job, you just need to provide the right tools. The repair tools here are nutrients (the right kind of protein and amino acids) and the carriers that will take them to the injured area (fast and slow-release carbs). You do want fast carbs to efficiently deliver the protein to the traumatized area; the only question is how much. This one is pretty straightforward – the amount of dextrose (or whatever sugar you’re using with your protein drinks) should be adjusted. After an intense physical activity, your body will push the glucose into the depleted muscles like it’s nobody’s business. That’s why you can get away with high doses like 60 or 70 g of dextrose after a workout. In recovery, you’re just another sedentary person burning calories for the basic needs of your body. Anything more than that and you’ll start storing the excess as fat. This is not just about getting “thick,” but the added weight can directly slow the healing and make it more difficult to get back into shape once you recover. The bottom line here is to do the math based on your metabolic rates and, when you do use sugar to deliver the protein, use it in smaller doses to allow your body to effectively process it. All of what we said above goes for other simple carbs, too, such as pasta and bread. To simplify it all – increase your intake of complete protein (it’s crucial for the healing of soft tissues) and balance it with a wholesome carb intake of fruits and veggies. Supplementing your diet with vitamins is probably a good idea, but anything more than that (specific supplements like chondroitin) will have to be agreed on with your physician. You don’t want to burden your liver with the chemicals that you might don’t need. If you’re a smoker, stop! Yes, yes…we know that it’s easier said than done but if there ever was a chance to stop smoking it’s the period of recovering from back injury. The reason for that is that you now have an immediate and urgent cause. Smoking has been proven to deprive the spine of oxygen, which is critical to the recovery process. So let us be precise about it – it can make all the difference in the world. Strictly following the guidelines and being smart about it can cut your recovery time in half. On the other hand, having the “whatever” attitude can double it. Being “extreme” doesn’t mean being irresponsible with your body, especially when it’s in pain and needs your help. This entry was posted in Health, Snowboarding, Winter Sports and tagged Back Injury, Snowboarding. Bookmark the permalink.